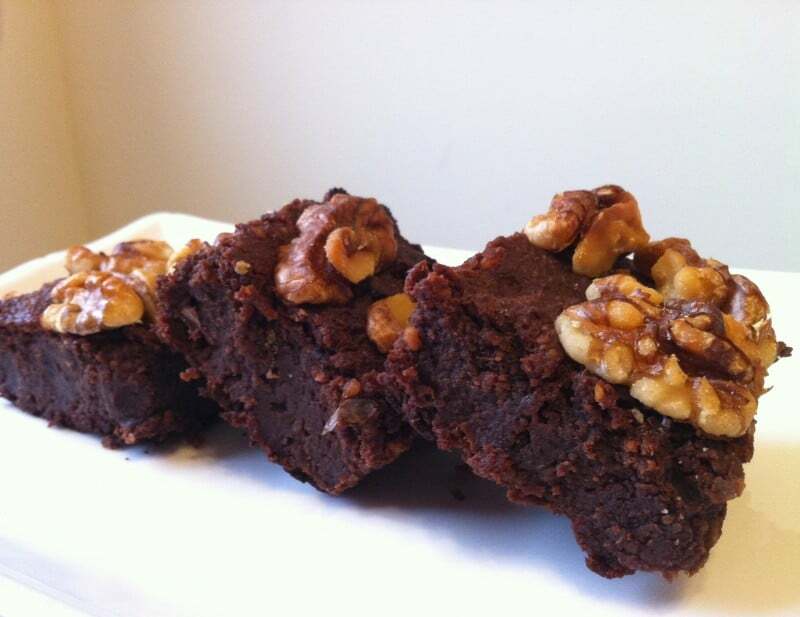 This date sweetened brownie recipe really hit the spot! I was fiending for chocolate last night and thought that these would be the perfect cure. 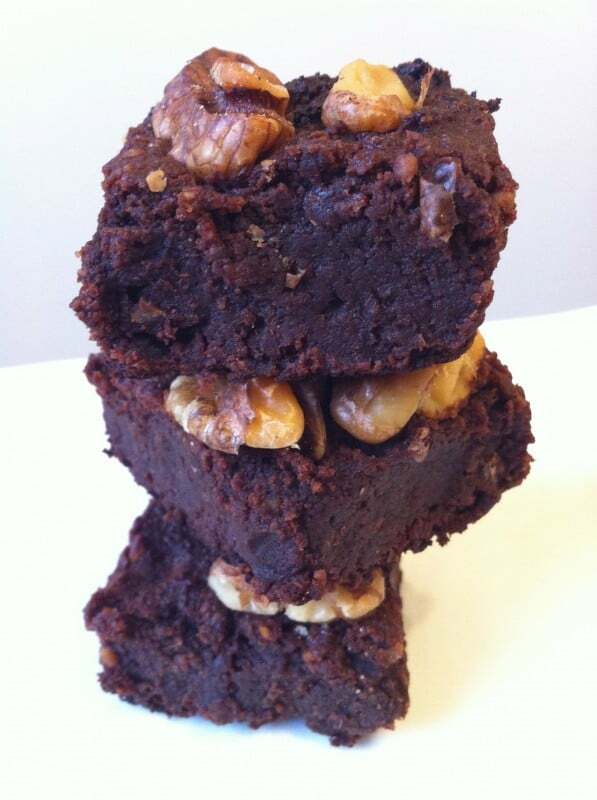 This date sweetened brownie recipe is delicious and just the right amount of sweetness despite having no processed sugar in it. The texture is perfect; moist, fudgy squares that melt in your mouth! And, they’re still totally vegan, gluten-free and sugar-free! 1. Pre-heat oven to 350°. Remove the pits from the dates and soak in 1/4 cup warm water for a few minutes. Then, in another bowl combine ground flax seeds and water and allow to congeal. 2. Using a double boiler, melt the baking chocolate and coconut oil together. 3. Put the dates and water in a food processor and chop into a paste. Add flax mixture, almond milk and vanilla. Then, add dry ingredients and process. Lastly, add melted chocolate and coconut oil and mix until all ingredients are combined. 4. Pour batter into an 8 in. baking dish that is either oiled or lined with parchment paper. Place walnuts on top. 5. Bake at 350° for 30-35 minutes. Let cool for at least 20 minutes before eating. This recipe is featured in my ebook Paleo Vegan Sweets & Treats! 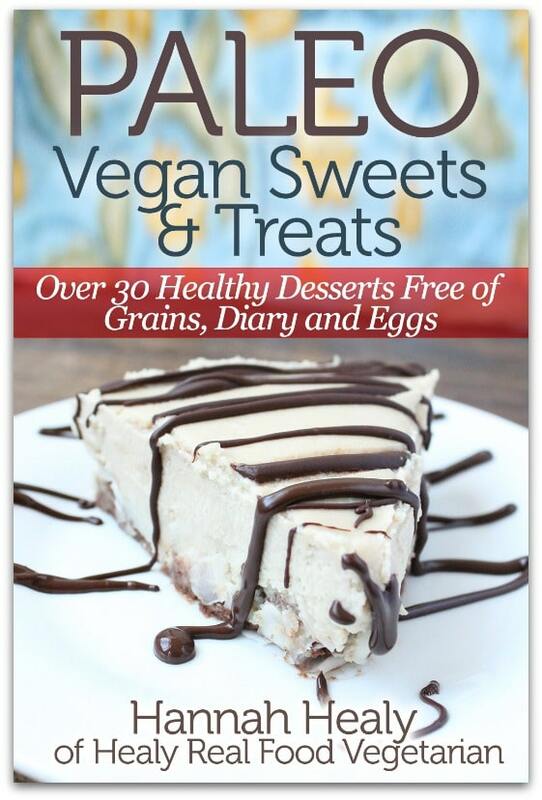 If you want to satisfy your sweet tooth without hurting your health, then Paleo Vegan Sweets & Treats is for you! Learn how to make your own healthy treats that are free of gluten, dairy, eggs, processed foods and processed sugars! Check it out here! This week’s link up is live, come on over and join the fun, if you haven’t already. Thanks Cindy! I hope you feel better soon! Thank you for sharing this recipe for brownies. I have been vegan for 9 months and have not had one single sweet since I started… I really miss brownies, so I am going to give this one a try! Hope you like them Elle! I have made these as we are eating sugar free and wheat free. These are absolutely delicious and filling. Thank you ! I skipped the “remove the pits from the dates” part and got to fish date pits out of the blender. That was fun! I subbed canned coconut milk for the milk of choice and did 2oz cocoa powder 1oz cocoa butter for the chocolate replacement. I also used 1 tbsp chia instead of the flax (I lost my flax but I found it once the food was in the oven). These were delicious! Thanks so much for a delicious GF/DF/Egg Free recipe! Can you tell me how you used the chia instead of the flax? The recipe says to use 2 Tb of ground flax. Did you grind up the chia and use only 1 TB? I have chia and would like to use this instead of the flax. These look so yummy. I have date sugar I would like to use instead of the dates Would that work?What could be substituted for the almond flour? I made these brownies tonight for my family. Everyone loved them. I love how fudgy they are.